It’s eight in the morning in Kinangop, a small rural town 55 miles north of Nairobi. For Joseph Kimani, a small-scale farmer, today is a big day. Kimani has been a farmer for two decades, but finding a market for his products has been a constant thorn in his side. There have been plenty of middle men to facilitate selling farm products, but they are all out to exploit the farmers. Today, Kimani is having his vegetables picked by Twiga Foods, an agricultural marketplace that is changing many farmers’ lives. The startup buys food from farmers and then distributes it to thousands of vendors across the country. The convenience alone is a godsend to farmers, but there’s more. Twiga buys at a higher price than local middle men and pays instantly via M-Pesa, the globally renowned mobile payment network. It also makes it possible for its clients to secure loans for their businesses, using blockchain technology. For most people, blockchain is the technology that powers Bitcoin. Beyond that, they don’t know much. However, in Kenya, blockchain is doing much more. It has given the thousands of farmers an immutable and real-time measure of their creditworthiness. Twiga employs blockchain technology to keep track of the transactions carried out by its clients. Using its data, the clients can also assess their ability to access loans and other financial products. While in most developed countries such data is easy to acquire, the narrative is quite different in Kenya, and Africa as a whole. Agriculture in Kenya accounts for over 50 percent of the GDP and provides the livelihood for 80 percent of the population. However, those involved in this sector continue to be marginalized by financial institutions, which deem them un-creditworthy. With most of the trading being done informally, data is difficult to collect. Twiga is not only changing the lives of farmers but the vendors as well. The 5000+ vendors who use the platform get to request the products they require, which are then delivered at a day’s notice. Before, they had to go to the market, where the quality isn’t assured and where they had to haggle over the prices. After making the purchase, they then had to transport the products to their stalls. This consumed both time and resources. The vendors also get the benefit of having their data collected and stored on the immutable distributed ledger. For vendors, the data is even more crucial than for the farmers as they require constant financing to grow their businesses. According to the World Bank, the lack of an established credit bureau is one of the biggest challenges facing small enterprises. These enterprises face a $330 billion lending gap, with Kenya –East Africa’s largest economy- accounting for $7 billion. Twiga -which is Swahili for giraffe- was founded in 2014 and has grown by leaps and bounds since. It was last year’s partnership with IBM, however, that has transformed it into a multi-million dollar company and one of Africa’s most promising startups. 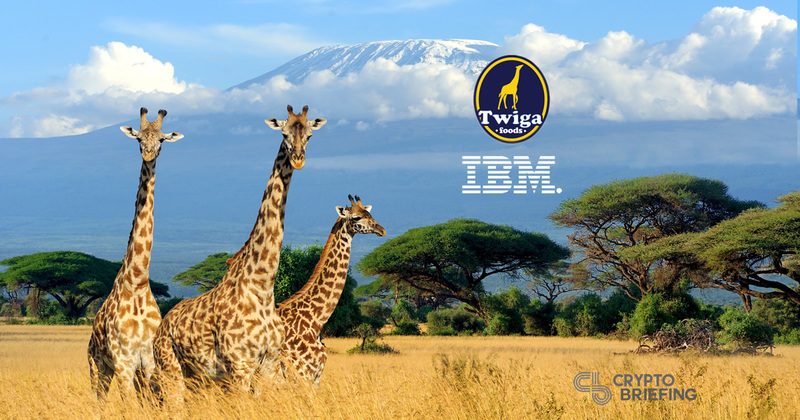 IBM used its expertise in distributed ledger technology, machine learning and data processing to develop Twiga’s blockchain platform. Now, the users can get the loan application process done entirely on the blockchain, making it easier, faster and more transparent. We analyzed purchase records from a mobile device and then apply machine learning algorithms to predict credit worthiness, in turn giving lenders the confidence they need to provide microloans to small businesses. Once the credit score is determined, we used a blockchain, based on the Hyperledger Fabric, to manage the entire lending process from application to receiving offers to accepting the terms to repayment. Blockchain technology has been hailed as revolutionary, and rightly so. In the future, even the internet could be decentralized. However, it’s the solutions that are available right now that matter. For the 15,000 farmers and vendors, blockchain is not just a hype word that people are using to attract funding. It’s a real solution to a real problem that has plagued them for decades.